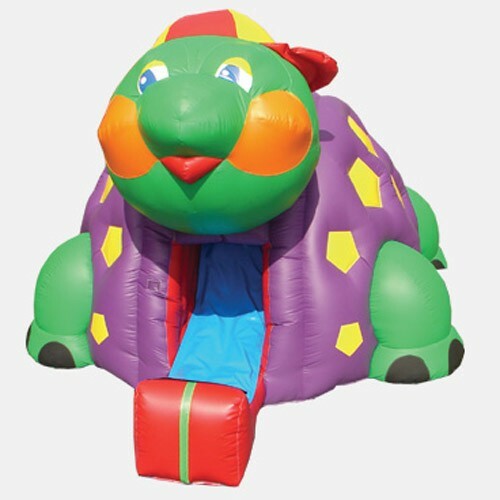 The Turtle Slide is a great unit for your rental business, Church, or other institution. The Turtle Slide brings more to the party than just a great slide. This loveable turtle is a wonderful centerpiece for "theme parties" and will also make your Family Entertainment Center stand out from the competition. (Like all of Happy Jump's slides, the Turtle Slide features replaceable steps and slide blankets.) Made of heavy duty commercial grade 18oz reinforced PVC material. Our KidWise Units are backed with a One Year Warranty against material defects and workmanship.